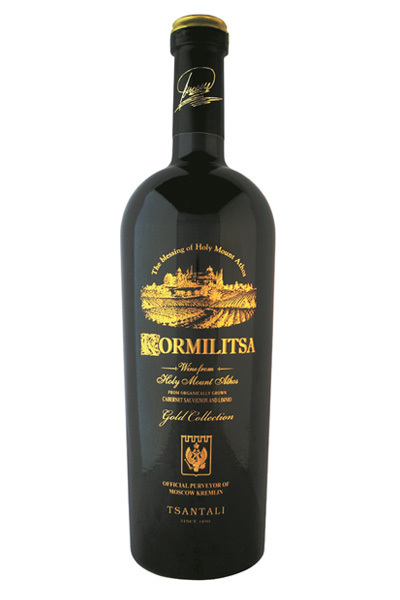 KORMILITSA GOLD is the first ever wine worldwide given the title of the “Official Wine of Kremlin Moscow”. A wine of deep scarlet red color that reflects the complexity and imposing character. On the nose, an ethereal, elegant bouquet of dark skinned fruits (like plums and forest berries), violet, licorice and seductive tones of underground vegetation. A hint of peppery plants quietly makes its presence known. In the mouth there is a muscular and exuberant structure supported by robust tannins and a balanced acidity. A very complex wine with a remarkable aftertaste. The grapes for KORMILITSA GOLD are picked from specific vine parcels, exclusively selected for the label. 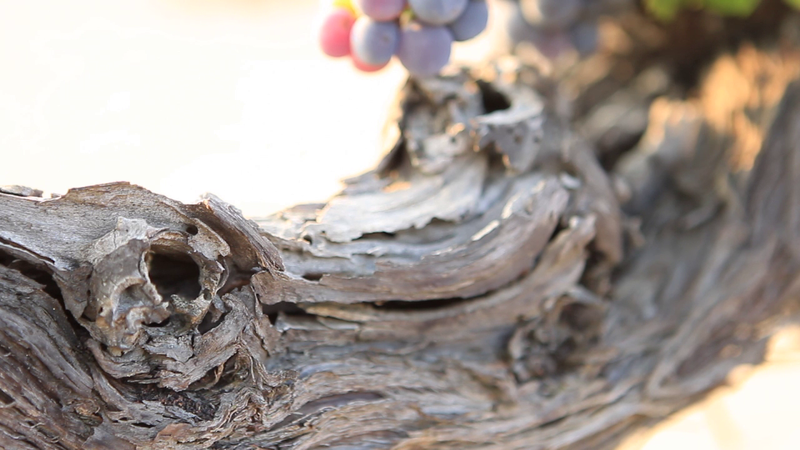 The Cabernet Sauvignon (80-85% of the blend) grapes come from three vine parcels of a total area of 4 hectares. The Limnio (10-15% of the blend) grapes come from a younger vine parcel developed by the use of the same clone that was found in Mount Athos when discovered in late 60s. The grapes are picked early in the morning in order to avoid high temperatures.The selected bunches are placed in wooden tanks (5 tons) for agitation and homogenizing. There is no use of yeasts nor auxiliaries. The fermentation is slow (10 days) during which “piégeage” is implemented aiming at the extraction of phenolic components. The two varieties are vinificated separately; the process is perfectly adjusted to the profile of each variety. The temperature is steady at 24°C. After fermentation the juice stays in contact with the grape skins (time depending on the variety) while the temperature is set free. Skin separation, malolactic fermentation in oak barrels or wooden tanks. 2007 has been considered as a challenging year. Due to the lower than average temperatures throughout the year, the grapes were handpicked before reaching deep maturation offering a wine of a more agressive tannic character. 2005 has been an exceptional year for Mount Athos. Thanks to the ideal conditions throughout the year, the grapes were handpicked in deep maturation leading to a wine of extraordinary complexity, richness and melted tannins. The Tsantali family has been reviving, for the past thirty-five years, the vineyards ofthe Russian monastery of St. Panteleimon, in Chromitsa Mount Athos. The monastery is one of the most important monasteries of the Russian Orthodox Faith. The monastery and the Metoxi fell into decline after the October revolution, since the Soviet regime rejected the idea of religion, and so this region of incomparable beauty was neglected and left to vanish. 1969 is a key date for the vineyard of Metoxi Chromitsa: while Evangelos Tsantalis was hunting at the region, a sudden torrential rain forced him to take shelter in the convent. Once the rain subsided, the uniqueness of this neglected vineyard drew the attention of Evangelos Tsantalis, who envisioned the revival of this vineyard. Indeed with respect to tradition and to the history of the region, the Tsantali family revived the vineyard, the destroyed buildings were restored and the monastery managed to regained resources from this partnership, the result of which was the first certified local wine of Greece – the Protected Geographical Indication of Agioritikos wine. After the radical change in the political environment in Russia, when the Russian Orthodox Church regained its lost prestige and power, attention was drawn to the religious significance and spiritual mysticism that Mount Athos represents. In September 2005, President Vladimir Putin visited the Monastery (the first Russian president to visit it since the restoration). During this visit the only ‘seculars’ invited to attend, was the Tsantali family. During lunch which was held on the monastery a special wine was served, an aged red wine, especially bottled for the President (on the label there was a special dedication on his honor). President Putin was delighted by the quality of the red wine along with the custom dedication on the label and once again personally thanked the Tsantali family for the revival of the monastery. This event was highly covered by the Russian media, not only in TV reports but also with a special tribute in one of the largest newspapers in the country, the Moscow Times, which presented thoroughly the wine tasted. The importance of Mount Athos was highlighted by the Russian Patriarchate, the Organization of the Kremlin (that certifies official suppliers) and the Tsantali family, by presenting the extra premium wines produced by the Metoxi vineyard called “Kormilitsa” in Russia, resurfacing the legend that was lost through time. Today, Russian VIPs visit the monastery and vineyard in Kormilitsa, following both the steps of the Tsars centuries ago, as well as their President’s today. The “Kormilitsa” collection consists of three organic wines of limited production (two red wine that concist of the varieties of Limnio and Cabernet Sauvignon and one white consisted of the Assyrtiko and Chardonnay varieties). The “Kormilitsa Gold Collection” (red wine), the “flagship” of the collection, is only available in five thousand four hundred and fifty numbered collectible bottles. All bottles are bearing the crest of the Kremlin, after the title of “Official Purveyor of the Kremlin Moscow” wine “Kormilitsa” was awarded on April 19, 2007 at a special event held in the Golden Hall of the Throne in the Kremlin Grand Palace. This title was awarded for the first time to a winery on a global scale. It is worth noting that there has been a thorough study by a specialized team of the Kremlin, which explored and tested every stage of the cultivation and wine production for more than three years. Click HERE to read Yiannis Karakasis MW ‘s blog following his visit to our Mount Athos vineyard. 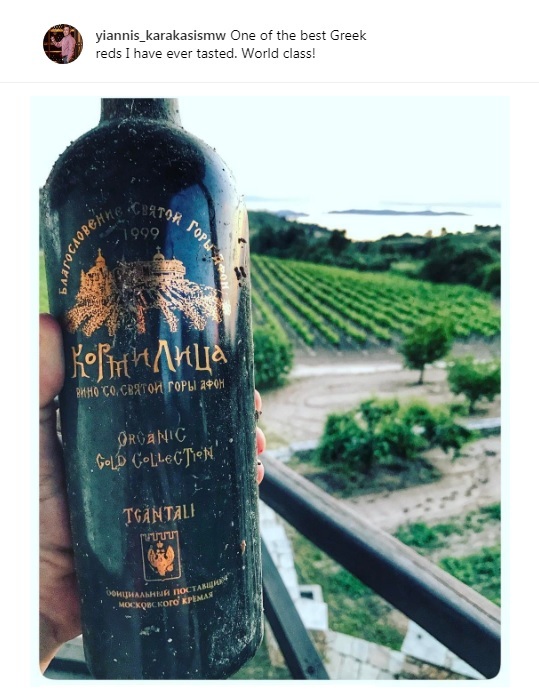 95/100 for the 1999 vintage KORMILITSA GOLD, mind-blowing photos and videos from this stunning vineyard.